Around 8 a.m. on Wednesday, Adedayo Adedoyin waved her 6-year-old twin son and daughter off as they took the short walk to their school, a few meters away from their home in Lagos Island.An hour later, she heard anguished screams outside. A nearby building had collapsed, and her children were inside it. Adedoyin raced to the scene, where a small crowd had gathered and a search had begun for survivors among the rubble of the aging three-story building that had given way without warning, trapping residents, pupils and small goods traders inside. The building had been marked for demolition at least three times, a buildings expert said in an interview with the Nigerian News Agency. He added that there are many similar buildings in the Lagos Island area that are also at risk. “There are over 1,000 distressed other buildings of this nature in Lagos, which, if nothing is done to demolish them, they will still collapse, resulting to more calamities in the state,” said Kunle Awobodu of the Building Collapse Prevention Guild. “The collapsed building had been marked for demolition about three times, but the building regulatory agency has not demolished it,” Awobudu said. Members of the Lagos Island community joined forces with rescuers from the Lagos State Emergency Management Agency to pull mostly children out of the rubble. Adedoyin hoped desperately for a glimpse of her children among those rescued. Finally, her daughter Kehinde was pulled out. But she appeared unconscious and covered in dust as paramedics battled to revive her at the scene. 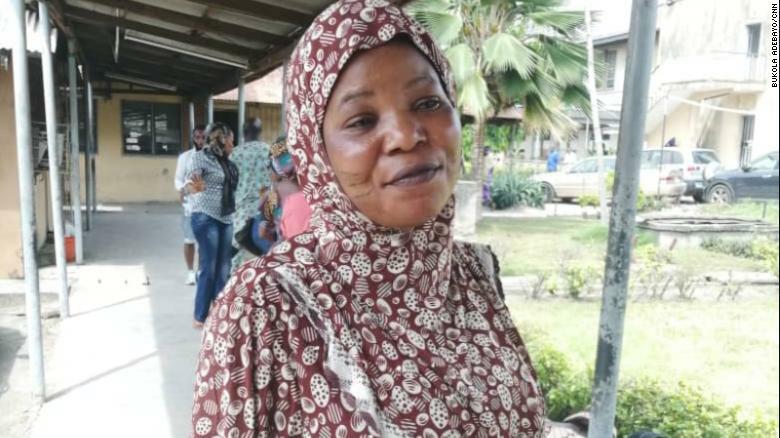 “She looked lifeless, and I was not even sure she was breathing,” Adedoyin said in her native Yoruba language.At the Lagos Island hospital, Adedoyin was relieved that her daughter was out of the building, but her thoughts turned to her son Taiwo, whose whereabouts she still did not know. It would be hours later that she would learn his fate. “I was at the hospital when I heard he died,” she said. Now she is praying fervently that her daughter recovers from her injuries. Adedoyin said she is full of regrets about her decision to send her children to the Ohen Nursery and Primary School, which they had attended since they were 3 years old. Lagos State Gov. Akinwunmi Ambode, who visited the scene on Wednesday, said the school was not authorized to operate in the building, which was designed solely for residential purposes. “The building is not technically a school; it is a residential building that was actually accommodating an illegal school, so to speak, on the second floor,” he said. “If I had known that the school was not supposed to be there, I wouldn’t have sent them there. We all thought we were doing the best for them. I am only hoping that my daughter survives,” Adedoyin said. During the governor’s visit to the area, Ambode added that many houses in the area had structural problems and would be demolished. Nigerian President Muhammadu Buhari on Wednesday said he was saddened by the incident, which mostly affected children. “It touches one to lose precious lives in any kind of mishap, particularly those so young and tender. May God grant everyone affected by this sad incident fortitude and succor,” Buhari said. The President urged the state government to put in place measures to prevent such “tragic” occurrences. Hundreds of families have been keeping vigil at the three leading hospitals in Lagos, where victims of the building collapse are receiving treatment. Around 41 people have been rescued from the building, which collapsed in the Ita-Faji area of Lagos Island, authorities said.At the Lagos Island Hospital on Thursday, family members huddled around a list of survivors posted at the emergency unit.Some breathed a sigh of relief as they saw the names of their loved ones on the list while others continued to hope and pray they would soon have news. 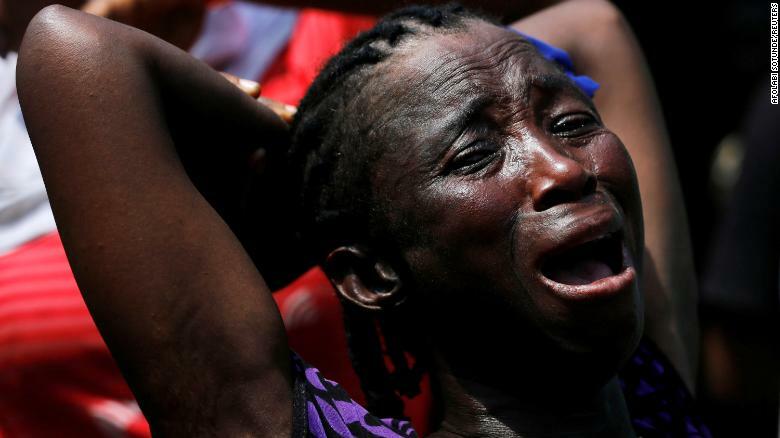 A woman cries out at the site of a collapsed building. The total number of deaths from the incident remains as yet unknown, but it is sure to be more than eight people currently reported by emergency agency officials. The building was situated in a densely populated part of the city, which is home to around 20 million people. Rescue operations ended at the site on Thursday afternoon as no more survivors were found, said Ibrahim Farinloye of the National Emergency Management Agency. “We have searched all the debris and gotten to the last floor of the building; there are no more survivors,” he said. Parents had told CNN on Wednesday that many buildings in the commercial hub in downtown Lagos were not safe. “A lot the buildings here are not safe. Even from looking at the building, you should know no school should be here,” Wale Wasiu said. Building collapses are frequent in Nigeria. At least 100 worshipers were killed in a church in the southern state of Akwa Ibom after the roof caved in during a Sunday service in 2016. In 2014, more than 70 people died after a two-story guest house in a church collapsed in Lagos.